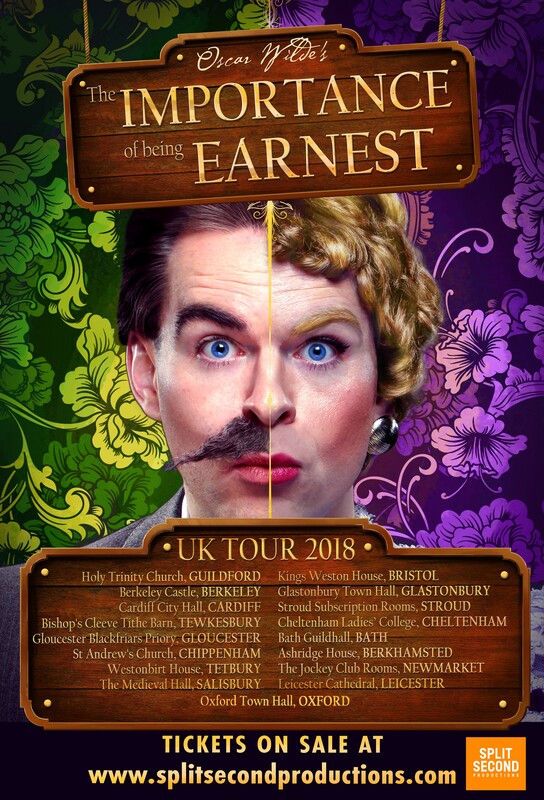 Oscar Wilde’s cherished ‘The Importance of Being Earnest’ is to tour the UK this Spring – but not quite as you may know it. The hilarious, two man re-imagining of the classic will visit over 20 beautiful venues across the country from Cardiff all the way to Leicester. Already one of our nation’s funniest plays, the “exhilarating” Split Second Productions is making its unique mark with their “ingenious” re-telling of the story where two actors will play every single character. Rapid quick-changes, tap dancing, fabulous frocks and enough tea to sink a ship, audiences are in for a wildly waggish time. It’s Oscar Wilde’s classic as you’ve never seen it before! The riotous tour will stop at manor houses, town halls and castles around the UK, performing in some of the most exquisite drawing rooms and great halls that this country has to offer – just as Lady Bracknell would deem fit. Bryan Hodgson – the writer and creator of this innovative adaptation will co-direct the show, straight from acclaimed (and award-nominated) back to back productions in London. Alongside him is Jaq Bessell, who has worked across Europe, in London, at the RSC, The Globe and in New York. The cast is to be confirmed.